While former Australian players coming out to admit CA’s problem is a good sign, BCCI’s current mess would put every Indian to shame. 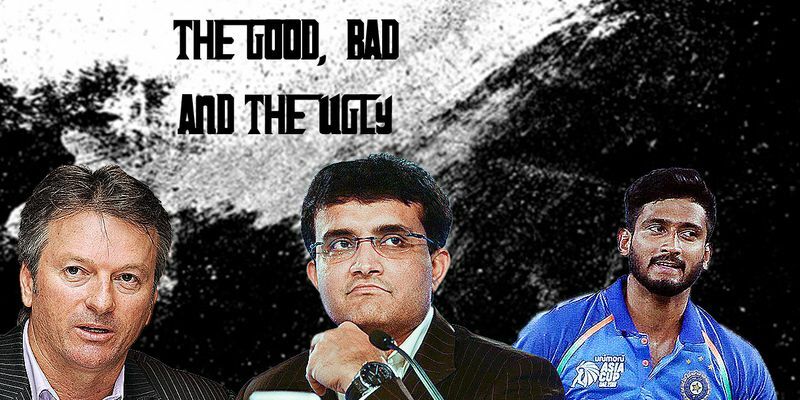 From Indian wrestlers getting foreign contracts to the severe backlash MS Dhoni’s exclusion got, we bring you the good, bad, and ugly from this week. Seven months after the sandpaper-gate saga that had brought scathing criticism to Cricket Australia and shame to the country as a whole, the cricket board was rocked again following an independent investigation. The investigation had discerned that the governing body’s "arrogant" and "controlling" culture was the reason players lived in a "gilded bubble” safe in the idea that they could get away with anything. While Cricket Australia was fast in asking its chairman David Peever to step down following the massive outcry, former Aussie skipper Steve Waugh has raised a pertinent point stating that it was ICC’s long-term leniency that had today led to players crossing the limit. Whether it was Michael Atherton in 2004, Waqar Younis in 2000, Shoaib Akhtar in 2003, Rahul Dravid in 2004, or even Faf du Plessis in 2016 – the meek punishments included few match suspensions, or a portion or full match fee of the guilty players. Waugh pointed out that the lack of a severe punishment on all previous occasions had today given rise to the complacent attitude harming the spirit of the game. It took the country years and some recent public humiliation by wrestlers before it realized that they have enough wrestling talents to make it a self-sustainable sport. In their recent move to offer wrestlers central contracts, like the cricketers of the nation, it has become a first for any sport in the country. India would go into the Tokyo 2020 Olympics with wrestling as their biggest hope for gold after encouraging displays at the Commonwealth Games and the Asiad, and this performance-based contract should work magnanimously towards inspiring upcoming athletes. The contract will be according to different grades descending from international tournaments like Olympics, Youth Olympics, Asian Games, World Championships, Commonwealth Games, and so on. So, while the likes of Sakshi Malik, Bajrang Punia and Sushil Kumar would get contracts of the highest grade, the wrestlers in the junior, sub-junior and U-23 age will get accordingly. If Cricket Australia is under huge criticism then BCCI is at a place where another wrong step and they would face a severer backlash. The most powerful cricket association in the world, BCCI is currently amidst a deep muddle that is very difficult to come out of. After abrupt amendment in constitution that created a massive rift between the board and the cricket associations, the harassment allegations against Rahul Johri have taken things too far. And when someone like Sourav Ganguly feels the need to write a letter to the board pointing their downfall, it cannot get any worse. It is ironic how the Supreme-court appointed Committee of Administrators (COA), which was supposed to act as a check on BCCI, has ended up getting tainted working as its guardian. Not bringing up the famous rotten apple idiom into the context, but observing closely why Vinod Rai has been shielding Johri despite multiple sexual harassment allegations against him that even led to the division of the panel with Diana Edulji, is fishy to put it mildly. And if the independent panel doesn’t come to decision first, BCCI is in for some real denigration. After his decent displays in the Asia Cup, India’s left-handed fast bowling protege Khaleel Ahmed is slowly making a name for himself. A rare breed of bowlers, Ahmed has been improving with every match and could make himself a mainstay in the Indian side especially after his brilliant performance in the fourth ODI against Windies where he had figures of 3/13. Another emerging player of Virat Kohli’s GenX side that looks ready to conquer the world, Ahmed has all the right talents to take him to the top but suffers from cricket’s now popular phenomenon of misplaced aggression. Ahmed’s send off to Windies’ Marlon Samuels in fourth ODI was a Level 1 breach of the ICC Code of Conduct and led ICC to warn him with one demerit point. And while a proactive skipper like Kohli would only encourage his players to continue exhibiting such condescending traits as long as it helps him win games, it is exactly the kind of culture that the ICC is looking to curb. Sending off a batsman with derogatory remarks and gestures might not be seen as gravely as sledging, but if a team keeps breeding this culture, then it is not far when India would be standing in Australia’s shoes few years later. It is really unfortunate that at a time when boxers like Amit Phangal and Vikas Krishnan Yadav have stepped up and look promising to change the history of the sport in the country after their gold and silver feats at the Asian Games, that the AIBA stand on the brink of getting removed from the Olympics. The International Olympic Committee had made it clear to the Amateur International Boxing Federation (AIBA) two days back that if they went on to elect Gafur Rakhimov, who has been linked to organized crime of heroin trafficking by the US Treasury Department, as the association’s president, the international body might consider removing boxing as a sport altogether from the Tokyo Olympics 2020. The IOC has been miffed with AIBA since the judging scandal of the 2016 Rio Games where all 36 officials and referees were suspended after allegations of bout-fixing. However, despite IOC president Thomas Bach clearly issuing the warning, the AIBA went on to cross the line and elect Rakhimov, who got an overwhelming 86 votes. While we are still waiting for IOA’s decision on this, this uncertainty is surely going to affect the mindset for the boxers preparing for the 2020 Olympics. The biggest news amidst the recently concluded series between India and Windies wasn’t India’s comprehensive victory or Virat Kohli’s continuing batting form, but MS Dhoni’s exclusion from the T20I series against Australia and Windies. The wicket-batsman has been out of form scoring just 123 runs in the seven matches he has played this year. Even in ODIs, the 37-year-old has struggled to put runs on board managing 171 runs in 11 matches in 2018 giving every hint that his time is up. But, the nation didn’t take it nicely and chief selector MSK Prasad received scathing criticism for dropping the wicketkeeper batsman from T20Is. The situation was so extreme that Facebook saw anti-Prasad page springing up all of a sudden like “MSK Prasad – The Selfish Politician”. Though both Virat Kohli and Prasad came out to clarify that Dhoni would return to the fore soon, it was ironic how people have reacted to the decision. Six years back in 2012, it was Dhoni who had picked on Sachin Tendulkar, Gautam Gambhir, and Virender Sehwag, labeling them as “liability” to force the rotation policy, and we hardly remember any such backlash then because the then skipper had just won India the World Cup.